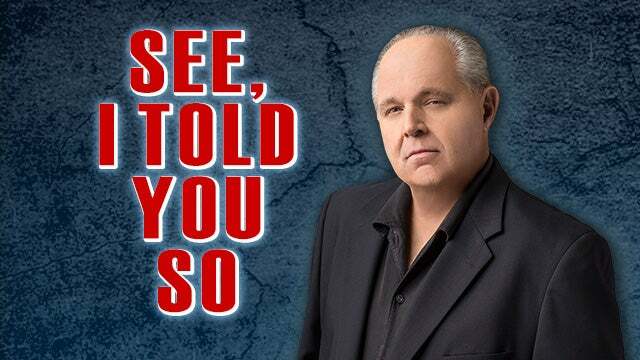 RUSH: You know when I was talking about this loophole and the kids coming in from Honduras, El Salvador, Central America, and the Obama administration basically grabbing them after they had made it across the border and then dispersing them to left-wing Democrat families all over the country? I had this nagging memory that I had discussed all this before. “I should have seen it. It was right in front of my face and you know why it didn’t occur to me? It’s because it’s so outrageous. President Barack Obama, it is said, is considering the idea of granting refugee status to the children of Honduras. Now, that I predicted. That’s not what I missed. We all knew that was coming. I mean, ever since we began hearing the term ‘migrant’ and ‘refugees,’ as opposed to illegal alien, illegal immigrant. We knew that was coming. “What I didn’t foresee, Obama is going to send U.S. officials to Honduras and okay them as refugees and then use taxpayer dollars to fly them to America so they don’t have to catch the death train and go through Mexico. We’re gonna cut out the middleman. We’re gonna cut out the coyotes. We’re just gonna bring them here as refugees. We are going to facilitate. We’re actually going to provide the transportation mechanism for what are illegal immigrants to cross the border. It’s going to be done with an executive order. There’s no way any of it can be stopped. And I remember this, when I did the keyword search at RushLimbaugh.com, this all came flowing back. And I will never forget this bit of news we stumbled across that Obama was actually going to send U.S. officials to Honduras and sort of preselect or preauthorize refugees and just fly them here since the loophole existed. And remember when this first started, they called these trains with all these kids on them death trains because the news now and then contained reports of some of these kids dying. July 25th here. It’s hot. The trains are not air-conditioned. They’re basically freight trains. These are not souped-up passenger liners. And these kids were being sardined on these trains by their parents. So this was seen as a compassionate thing to do, since the thinking was they’re going to come anyway. Why, we may as well just facilitate it. Now, again, this is 2014. I don’t know if this pilot program actually was implemented for more than just this one year. And I don’t remember the extent to which this program was implemented and how successful, quote, unquote, that it was. But essentially we were gonna send U.S. officials to Honduras, which is where this caravan is largely from, by the way, this current caravan. The objective was to make sure the term “illegal immigrant” was not attached. And by and large, if you look at the media coverage of this caravan, you don’t see the word “illegal” or “immigrant.” You see “migrants” and “refugees,” by design. Now, the AP, this is hilarious. The AP objects to the use of the term “loophole.” But when they’re talking about tax law, they love to use “loophole” all the time, talking about loopholes that allow the rich to avoid paying taxes. There are no loopholes in the tax law. There is simply tax law that people can use and take advantage of. This is an actual loophole! This is something that as apart and beyond every other day normal immigration law and policy. And nobody can explain why it’s there. He went on a tweet storm about this. And that’s why there’s a lot of attention being focused on it, because, folks, it is what it’s always been. It remains the number one weapon in the left’s arsenal for cracking, attacking, diluting American culture, the distinct American culture, our set of traditions and institutions and values, by flooding the country, over time, with people who are not interested in assimilating, who can’t speak the language, and don’t even know what these distinct traditions and cultures are. In fact, many native Americans don’t either, anymore, as evidenced by NPR’s attempt to explain Easter.